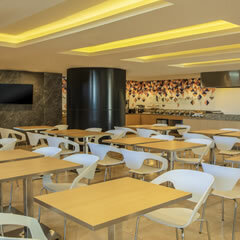 Fiesta Inn Express Querétaro Constituyentes has been designed with modern and customizable spaces that reduce stress and provide unparalleled comfort to business travelers, ensuring a relaxing and productive stay. The hotel is located at the Puerta La Victoria shopping center, next to the Josefa Ortiz de Domínguez Auditorium. It is conveniently located just 10 minutes from the Convention Center, 12 minutes from the Historic Downtown District, and 15 minutes from the area’s most important industrial parks. This hotel is home to 117 guest rooms that offer an extraordinary view of the city as well as other amenities, including wireless Internet access, a meeting room and fitness center. Guests enjoy a complimentary buffet-style breakfast, and 24-hour tea and coffee service and grab-and-go food items are also available. Start the day off right with our complimentary breakfast buffet, and come back for lunch and dinner with our à la carte service. If your schedule is tight, take advantage of our grab-and-go food items or our 24-hour coffee and tea service. 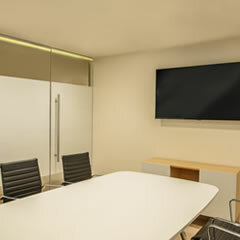 We have a fully equipped meeting room where guests can work in complete privacy or host productive business meetings. Leave the stress outside as you step into a haven of relaxation and creativity. This room comes with a king bed, executive work desk and chair, telephone, wireless Internet access, LCD TV with cable, closet, air conditioning, full bathroom, and complimentary toiletries. Guests can also take in a spectacular view of the city. Make your business trip a success in the complete comfort of this functional room. It includes two doubles beds, executive work desk and chair, telephone, wireless Internet, LCD TV with cable, closet, air conditioning, full bathroom, and complimentary toiletries. This room also offers a beautiful view of the city. The spaciousness and functionality of this room makes it perfect for working, resting and relaxing. It includes a king bed, executive work desk and chair, telephone, wireless Internet access, LCD TV with cable, closet, air conditioning, full bathroom, and complimentary toiletries. This suite also showcases a breathtaking view of the city. A functional and comfortable room designed to meet the special needs of our guests. It features a single bed, work desk, closet, telephone, wireless Internet access, air conditioning, and LCD TV with cable. The bathroom also comes equipped with an extra-wide door, walker, raised toilet, and safety rails in the shower and next to the toilet.